I’ve always been a fall guy. The crispness in the air, the layered fashions, the rustic colours of the leaves and the season’s deep, harvest flavours all enliven me in a way no other season does. But fall’s true jewels are the brave and hardy flowers that seem to defy the coming of frost with their brave blossoms. Asters and chrysanthemums are my two fall favourites and I’ve wasted little time filling my balcony (and even my bedroom) with potted mums. Below is a summary of chrysanthemum information I hope you’ll find useful and interesting. Most of it was garnered from the National Chrysanthemum Society of America, a site you ought to visit if you’re as much a mum enthusiast as I am. These ones are on my balcony at the moment. I love the warm rust colour. So very fall! The chrysanthemum was first cultivated in China as a flowering herb and is described in writings as early as the 15th Century B.C. In fact, some of the earliest Chinese pottery depicted the chrysanthemum. As an herb in ancient China, it was believed to have the power of life. Legend has it that the boiled roots were used as a headache and flu remedy; young sprouts and petals were eaten in salads; and leaves were brewed for a festive drink. The ancient Chinese name for chrysanthemum is "Chu." The Chinese city of Chu-Hsien (which means Chrysanthemum City) was so named to honor the flower. Around the 8th century A.D., the chrysanthemum appeared in Japan. So taken were the Japanese with this flower that they adopted a single flowered chrysanthemum as the crest and official seal of the Emperor. 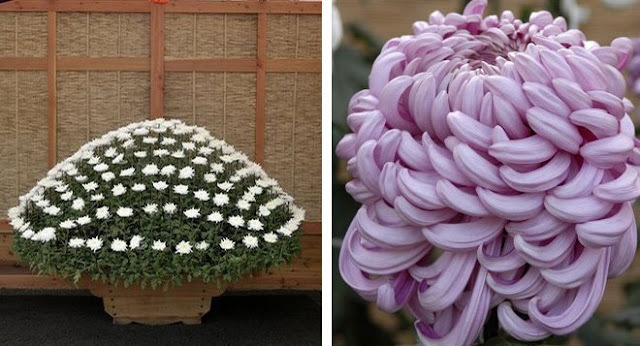 The chrysanthemum in the crest is a 16-floret variety called "Ichimonjiginu." Family seals for prominent Japanese families also contain some type of chrysanthemum called a Kikumon – "Kiku" means chrysanthemum and "Mon" means crest. In Japan, the Imperial Order of the Chrysanthemum is the highest Order of Chivalry. Japan also has a National Chrysanthemum Day, which is called the Festival of Happiness. Recently at the New York Botanical Gardens, the largest kiku exposition in North America was held, with stunning examples of Japanese mums, trained to grow in unusual forms, including dramatic, cascading mums that all grow from a single stem, like these ones below. Japanese examples of chrysanthemums at the New York City Botanical Gardens last year. Since the chrysanthemum was first introduced into North America during colonial times, its popularity has grown such that mums now reign as undisputed "Queen of the Fall Flowers." Chrysanthemums come in a wide variety of colors, including white, off-white, yellow, gold, bronze, red, burgundy, pink, lavender and purple. Mum plants can grow to be 2-3 feet high, depending on the cultivar and growing conditions. Chrysanthemums also come in many flower forms; that is, chrysanthemums are often grouped by the shape and arrangement of their petals. The most popular flower form is the "decorative," which is so packed with long, broad petals that you can hardly see its center. These ones are in my bedroom. I love it when the morning sun hits them through the window. Growing chrysanthemums in the garden requires getting a few things right; they're fussier to grow than many other plants. In the North, it all begins with buying cultivars that are hardy mums in your area. Potted chrysanthemum flowers are sold by the millions at nurseries in fall, because they've become a staple for outdoor fall decorating. 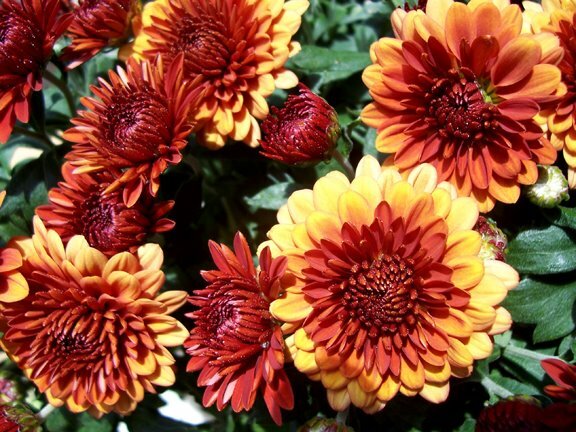 The chrysanthemum is the third highest-selling potted flower in North America, after geraniums and poinsettia, coming in at $68.9 million in sales in 2004. These are not necessarily cultivars meant to be grown locally. Most of the ones you see in nurseries and grocery stores this time of year are shipped in from greenhouses. 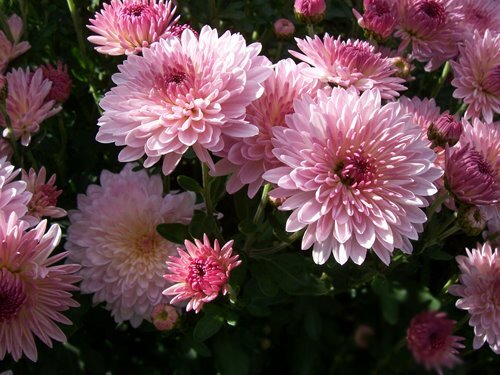 Also, because these chrysanthemum flowers are bought specifically for autumnal displays, many people often fail to plant them early enough to allow the chrysanthemums to become established in the garden: they should be planted at least 6 weeks before a killing frost, and even that may not be soon enough. Many people, however, do have great success planting potted mums in the ground, as shown in the two photos below of my mom's front garden. My parents have a little row of mums in their front garden that comes up year after year. My mother adds to it each year with another potted mum. Still, it's wiser to buy mail-order mums (single-stemmed rooted cuttings) from a catalog and plant them in spring, rather than planting potted mums you've purchased in fall. In a good catalog, you have all the relevant information in front of you. Also, spring planting gives the plants longer to become established. 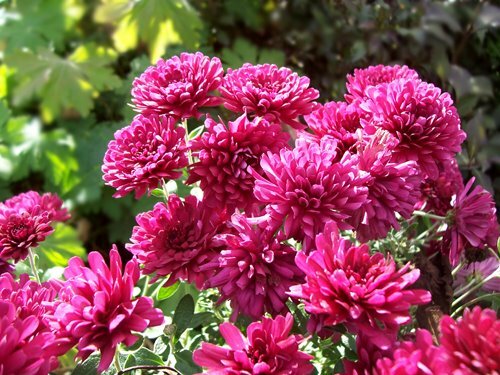 While chrysanthemum flowers hold up against light frosts, be mindful that hard frosts will damage the blooms. So, add some fall flavour to the front steps, the balcony, or even indoors, and enjoy some cool-weather colour with chrysanthemums. 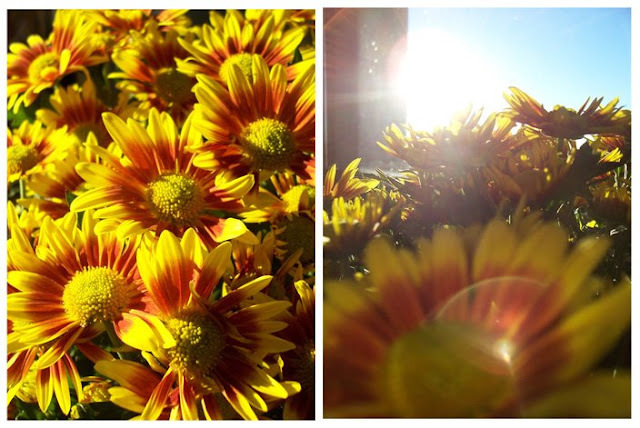 I love Fall, I love Mums, I love your pics and I love your blog! And I always love your enthusiasm, Carolyn!